Throughout the summer of 2015 the Neighborhood Academy is inviting activists, artists, architects, researchers and representatives of initiatives working on questions of urban and rural resilience, commons, land-politics and social housing. The invited guests, together with partners from Moritzplatz, Kreuzberg and Brandenburg, will work on local issues and exchange experiences and working tools through workshops, walks, interventions and with the help of manuals. Over time, based on the first program in the summer of 2015, an open and jointly build knowledge and experience platform will be formed. It will be complimented through the construction of an experimental architectural structure: a multi-story vertical garden. Starting with a nucleus, the garden architecture will gradually grow through DIY-constructing and evolve to a physical space for the Neighborhood Academy. 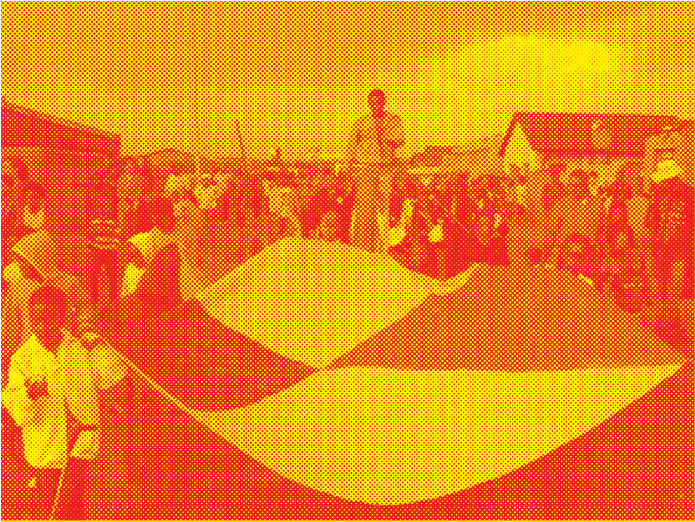 The Soweto-Projekt by “Design for the Living World”, are guests of the Neighborhood Academy in June. The Neighborhood Academy program includes workshops, film screenings and evening of public discussions, community cooking, excursions in neighborhoods and rural areas. The residents will together with local partners develop simple action guidelines that will lay the foundation for an Archive of Commitment. The exchange with local and international actors and organizations will help to build and support the development of community organized, socially and ecologically resilient neighborhoods – both urban and rural. Water and Land – In June, the class Design fort the Living World (Hochschule für Bildende Künste – HFBK – Hamburg) will explore the neighborhood around Moritzplatz and lead talks on questions concerning water and land. 5 open spaces for participation. Please contact nachbarschaftsakademie@prinzessinnengarten.net. Die Laube / The Arbour – The fat koehl achritects plan and initiate an experimental architectural structure as a physical space for the Neighborhood Academy. The building process starts with an open two-week-long DIY-constructing workshop in Prinzessinnengarten. If you want to participate in the building of the architecture, please contact nachbarschaftsakademie@prinzessinnengarten.net. This Land is Our Land – Throughout August, Paula Z. Segal of 596 Acres from New York and the architect and city-activist Anna Heilgemeir (Berlin) will organize mappings, discussions and walks, in order to render public spaces visible and ask questions on who has a right and access to collectively-owned land. Community Design Center Kreuzberg – The carpenter, architect, researcher and author, Mathias Heyden, will address the issue of possible forms of community organizing and shared work methods together with activists of Berlin city- and housing-initiatives, during two weekend-workshops in August. Urban Agriculture and Resilience – The artists Bonnie Fortune and Brett Bloom from Chicago, writing about art and ecology on www.mythologicalquarter.net, will research the topic of rural and urban agriculture from a resilience perspective during their stay from end of July until mid August. Their work will result in a co-authored text written together with the Neighborhood Academy. INLAND – The Spanish artist Fernando García-Dory will present the collaborative platform INLAND during his stay end of June. It investigates issues of territories, geopolitics, culture and identity between the urban and the rural. His contribution is the start of the planned expansion of the INLAND-Network to a farm in Brandenburg. Incorporated in the Neighborhood Academy, Florian Wüst is curating a film-program referencing to land-issues, tenant struggles and self-sufficiency in the city and on the countryside. What to do when utopia hits the wall of the present? – Doina Petrescu and Constantin Petcou from Atelier d’architecture autogérée, Paris, work on alternative models of living, production and consumption. They will present their highly regarded pilot project R-Urban, developed in and with the municipality of Colombe, and portray their negotiations with local politicians and administrations on the continuity of their endeavor.